We’ve known he was coming for a long time. It’s been over a year since Sony and Marvel made a deal that would bring one of the most popular comic book characters in the world into the Marvel Cinematic Universe. Today, we finally got our first look at the MCU Spider-Man as part of the final trailer for Captain America: Civil War. While we’ve only spent a few seconds with him so far, those moments have taught us quite a bit about this new version of the wall crawler. We suspected this would be the case. Recent marketing made it clear that Team Iron Man was outnumbered, since Team Captain America had six members, versus only five for the establishment's side. Also, Spider-Man siding with Tony Stark was a major part of the original Civil War comic book story which inspired Captain America: Civil War. Still, it was exciting to hear Iron Man call on his new friend, who he called "Underoos." Which is too perfect. One of the things that the film versions of Spider-Man have never been able to bring over from the comic books is his ability to make facial expressions with his mask on. It’s easy enough for a comic artist to draw the mask with different eyes when they need Spidey to squint, but Spider-Man in the movies has always been as expressionless as a Power Ranger. That ends now. 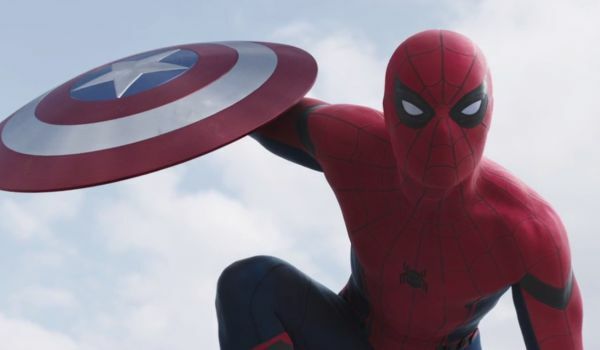 We see Spidey’s eyes react after he grabs Captain America’s shield. It’s the highlight of the trailer. 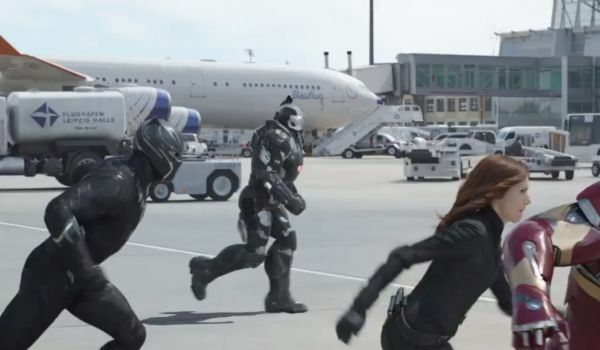 We know that a good portion of Captain America: Civil War is set to take place in Germany, and that includes the battle on the airport tarmac that we’ve seen repeatedly in the trailers. Check out the printing in the image above. That means that Spider-Man somehow makes it to Germany. It’s an odd place to find an American high school student. He didn’t swing there from Queens. Did Tony Stark fly him over on a private jet? Did the web-slinger make the trip on his own for his own reasons? We can't wait to learn those answers. One of the biggest criticisms among die-hard Spider-Man fans regarding the original Tobey Maguire trilogy of films was the way they made Peter Parker’s ability to shoot his web an organic part of his mutation, rather than having Peter build the devices himself, as he did in the comics. A closeup examination of the wrists of your friendly neighborhood Spider-Man appears to make it clear that his webshooters here are devices, not natural. He even brought extra cartridges so he doesn’t run out. This Peter Parker is a smart guy. He did get a scholarship after all. Need to see that full trailer one more time? Here you go. And in the comments, tell us what we missed about the new Spider-Man. 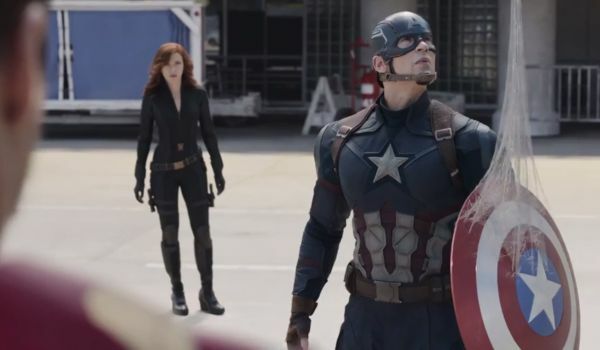 Captain America: Civil War opens in theaters on May 6.